Start your morning off with a couple of the yummy French Puffs. A couple of days ago I took a trip to my local public library. I wanted to see if I could find something inspirational for writing some rousing post for my blog. It seems the last couple of weeks since I started my blog my mind has been consumed with thoughts of my blog, what recipes I should add next, how I can get people to become followers of my blog… I wake up at night thinking about this. Oh well, I am sure as time goes on my mind will slow down and hopefully people will start viewing my blog, more than just my family. Well enough about that. Let’s return to my trip to the library. I headed straight for the section that houses the recipe books. I found several shelves filled with all kind of recipe books, but one caught my eye right away. The title of the book was More Minnesota Mornings and Beyond. A Cookbook & Travel Guide from the Minnesota Bed & Breakfast Association. It featured recipes from Bed and Breakfast Inns from all around the state of Minnesota. Most of the recipes were for breakfast foods. I decided to make one of the more simpler recipes; I would like to share it with you on my blog now. 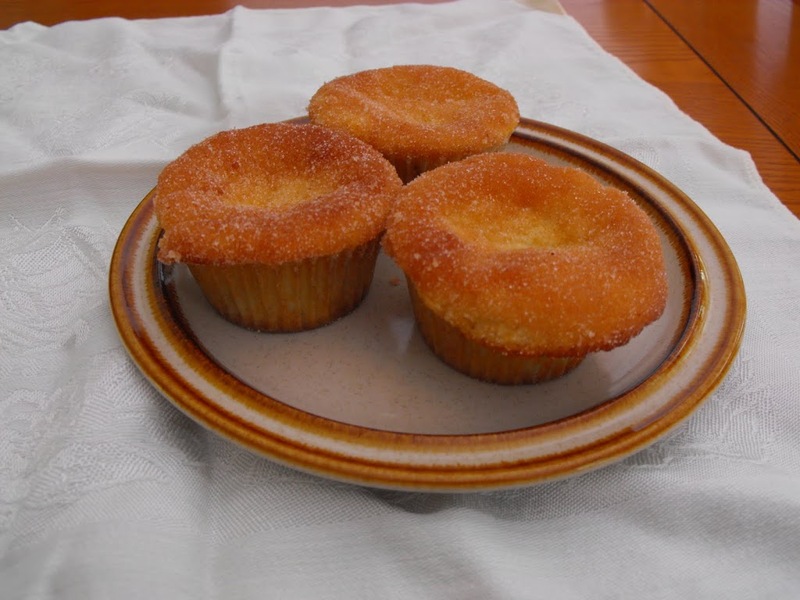 While muffins are baking, mix sugar and cinnamon in a shallow bowl. Melt butter. Preheat oven to 350 degrees. In a medium mixing bowl, combine flour, sugar, salt, baking powder, and nutmeg. Make a well in the center of dry mixture. In another medium mixing bowl, lightly beat egg. Add buttermilk and melted butter. Place wet mixture in the well of dry mixture; combine only until moistened. Do not over mix. Fill muffin cups 2/3 full and bake for 20-25 minutes. The top should be golden brown. When baked muffins are cool enough to handle, dip tops in melted butter and then in cinnamon/sugar mixture. Don’t worry if you don’t have buttermilk. I did not have any buttermilk so I substituted the buttermilk with milk and vinegar. (I took about 2/3 of a teaspoon of milk out and replaced with the vinegar. Let this mixture set for 5 minutes before adding it to the other ingredients.) I had learned of this substitute for buttermilk several years ago and it works well. I used baking cups for the muffin tins, this made it easy to remove the French Puffs from the tins. My muffin tins are a little smaller so I think that filling the tins 2/3 of cups was a little bit too much. If you have smaller tins fill only 1/2 of the cup. Overall I think the French Puffs turned out well. My family enjoyed them and I think that I will make them again.